I break the rules in movie theaters quite often. Like, I tuck my own healthy snacks inside my purse in order to avoid my weight gain inducing, popcorn, cheesy tortilla and soft drink cravings. But mostly, you'll find that I'll pull our my iPhone and jot down life changing tidbits hidden within a movie's dialogue on my Notes app that strike a chord. 1. "Very important thing, a family. You only get one,” said the Mad Hatter. Living within our families isn't always easy. I know growing up in mine wasn't easy. One day we were the perfect, twice-on Sunday and once on Wednesday church-going family. The next day, we were the newest broken, absent-father, lock-key-kid, mother-working divorced and church-shunned family in the pews. No matter how I wished my family were whole again, or wished I could live in a different family, I soon realized you only get one. You only get one family and I wanted my whole one back. 2. 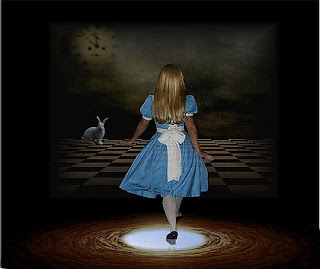 "If you don't go back and reconcile, you'll be sorry...You're family will be lost and you won't be able to do anything about it, " said Alice to the Mad Hatter. While my parents' reconciliation was my heart's greatest desire, it took me thirty years to work through the heartache and pain of an absent father. Unforgiveness became my secret defense weapon—holding him at arm’s length protected me from further pain. Unfortunately, I carried every relationship I had at arm’s length, hoping to protect myself from their possible rejection and abandonment as well. 3. "Forgive me?" asked the White Queen. "That's all I ever wanted," replied her sister, the Queen of Hearts. In the movie, Alice Through the Looking Glass, we learn the back story of why the Queen of Hearts harbors so much anger. You see, everyone has a back story which doesn’t dismiss their misbehavior, but it sure explains a lot. Once I learned my father’s back story and God helped me see my father through His eyes, (how God created him, how nothing could stop God from loving and forgiving him) then all my excuses to withhold forgiveness fell away. How could I not offer my father what Jesus so freely offered me? Freely offers the world? 4. "You cannot change the past but I dare say, you might learn from it," explained Time. No, we cannot change the past, even when we offer forgiveness. We don't own a chronosphere to travel back in time to make things right, like Alice did. But, we can move forward, learning the lessons from our past and with God's help, (always with God's help) we can forge a better future. 5. "To do the impossible, you must believe it is possible," declared Alice. Forgiving someone who has wronged you and hurt you deeply, may seem incredibly impossible to you right now. I get that. Although God confronted me about my unforgiveness, it took me over thirty years of working through my woundedness before I finally asked God for the impossible—the courage to face my father and offer him forgiveness and ask forgiveness of him. 6. "Everyone parts with everything, eventually," explained Time. While God created all things for his pleasure, including and especially family, sin entered the world through the first family of creation, and therefore, we all pass away...eventually. My father suffered a long good-bye. In some ways, I'd never want to relive that again and yet, it was the sweetest good-bye I've ever experienced. During his last months of life, God reconciled all the stolen years. We talked about the past and said all those important, unregrettable last words to one another. Best of all, God taught me how to be a good daughter to him; how to love and care for him unconditionally, until his very last breath. Do any of these statements challenge you today? What are some great life lessons you've learned from stories or a movie recently? If you joined us from the Christian Children's Authors blog today, thank you! Welcome to my blog.